Paddling With Parps (a.k.a. Kit Creation, Part Three) | Brew Hui. When I was little, my Grandfather (or ‘Parps’, as I affectionately call him) built our family home. It was – and remains, albeit under new ownership – a gorgeous labour-of-love, with lots of exposed wooden beams and plenty of excellent Nooks and Crannies (seemingly purpose-built for hours of joyful hide-and-seek). When we were teaching my sister how to walk – something we were told she’d never do – Parps transformed the backyard into a suburban rehabilitation clinic, complete with a walking frame course that circumnavigated the section like a meandering rollercoaster ride. You see, once a tool belt is strapped around his waist my Parps can pretty much do anything. He’s a bit of a Superhero in that regard (and several others, I hasten to add). So when I realised that my new homebrewing obsession might require Something Made of Timber – a mash paddle – I couldn’t believe my luck. My thoughts drifted not only to the promise of a sweeeeet custom-made paddle, but also the creation of new special moments with my Parps. 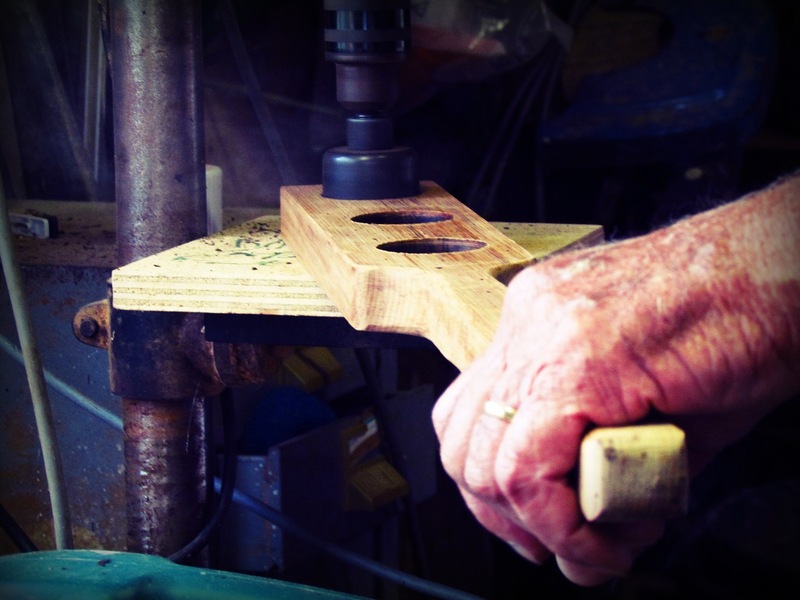 I gave him a call and sold the idea, nestling it softly within a promise to bring his Great-Grandkids up to visit – and within minutes of conception, the Mash Paddle Build was green-lit. A mash paddle is basically a big wooden stirring spoon – but instead of a spoon, it kinda looks like something you’d use to paddle a waka. The large holes that allow grain to move through the paddle render it fairly useless for water propulsion – but make it perfect for circulating the grain around a steaming mash tun. 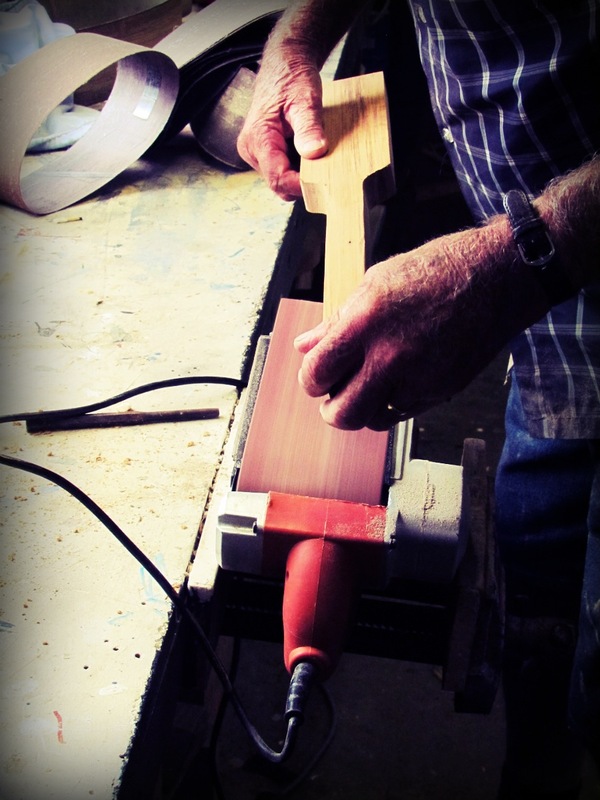 Because it can be made of wood, a mash paddle presents an opportunity to get a little creative – to add a personal touch that makes your equipment uniquely yours. 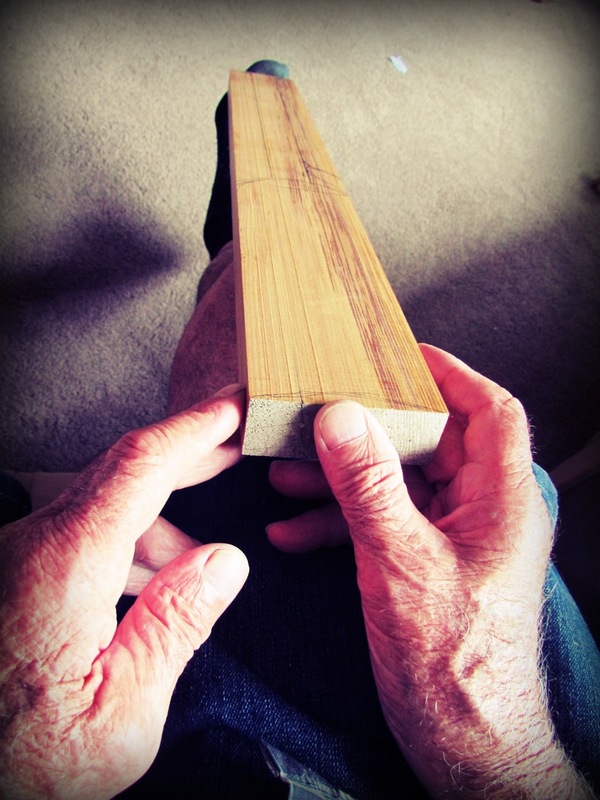 The canvas for my own paddle – designed based on Google searches and Octogenarian-carpenter know-how – was an immaculate piece of ‘heart’ Rimu, pulled from a dark corner in one of Parps’ several sheds. ‘Heart’ Rimu, taken right from the centre of the log, is as tough as nails – and equally difficult to cut, drill and sand. But cut, drill and sand we did (and when I say we, I mean it in the Royal Sense – since my usefulness was more-or-less limited to photography) – and in no time at all, the block of tough timber was starting to resemble something useful. It’s slightly surreal to be standing in a moment that you know you’ll never forget. Watching Parps shape and sand the mash paddle teleported me back to my childhood – where as an eager young boy I would stand on a nail box in his workshop and marvel as he created another piece of functional art for someone near-and-dear. His lack of need for ear muffs was a visible sign of a lifetime of good-hearing sacrificed upon the altar of Bad-Old-Days industry ignorance – back when asbestos was thought to be a reaaaallly good bang-for-buck insulator. 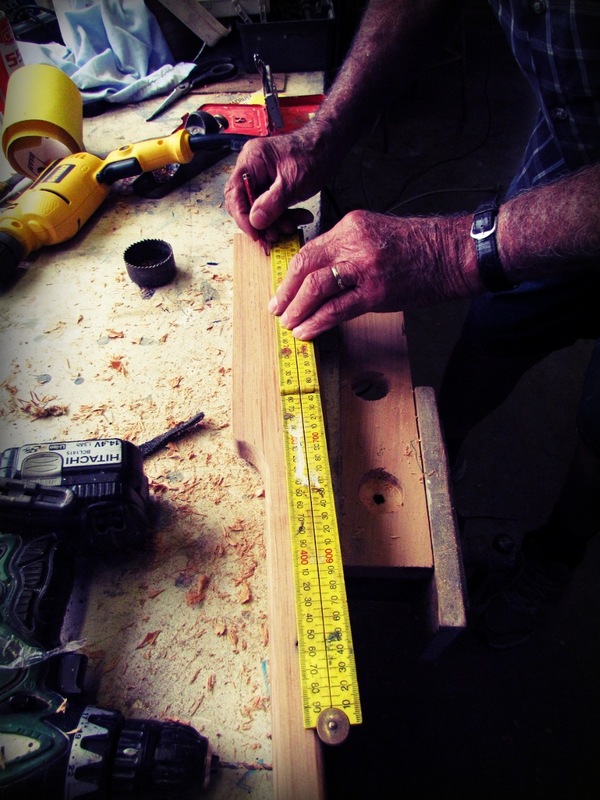 The muffs weren’t optional for me, since the heart Rimu was screeching as Parps drilled three holes along the main body – actually, screeching and smoking, with the timber fighting valiantly to stay in one piece. 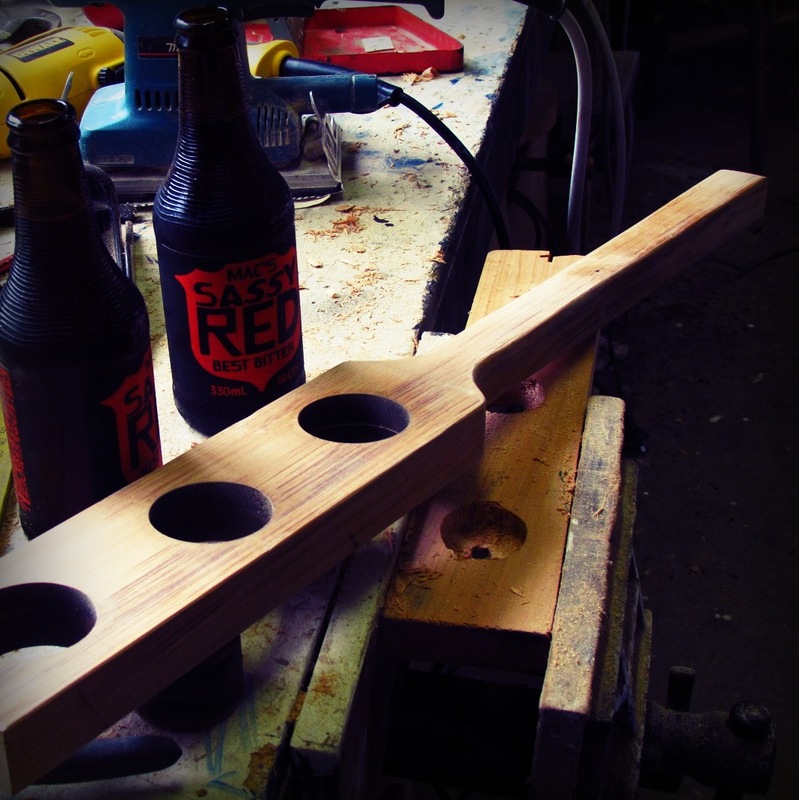 The gorgeous smokiness of the charred drill holes presents an enviable opportunity to create a smoke-inspired beer first-up – since the only way to avoid transferring the burnt Rimu character would be to give the paddle a good wash before using it. But that would somehow feel like an opportunity lost; and besides, I love smoky beer. Rex is my friend. Taniwha and I are best-bros.
Before I knew it, the build was over. The moment was gone, but the result was perfect: a gorgeous heart Rimu mash paddle, better than I could possibly have imagined. A true Parps Special. We toasted the build with a couple of Sassy Reds – a beer that I’ve always thought was a Diamond in the industrially-produced Rough. Parps seemed to like it, too – or if he didn’t, he was at least being polite. I’m fine with either. Statistically speaking, one day (in the very distant future) I’m probably going to have to brave a post-Parps world. The mash paddle – like the countless other pieces of functional art that he’s built – is yet another divine Horcrux, through which my Parps will live on forever. A little piece of him will be in every brew that the paddle touches – and that makes me very happy indeed.